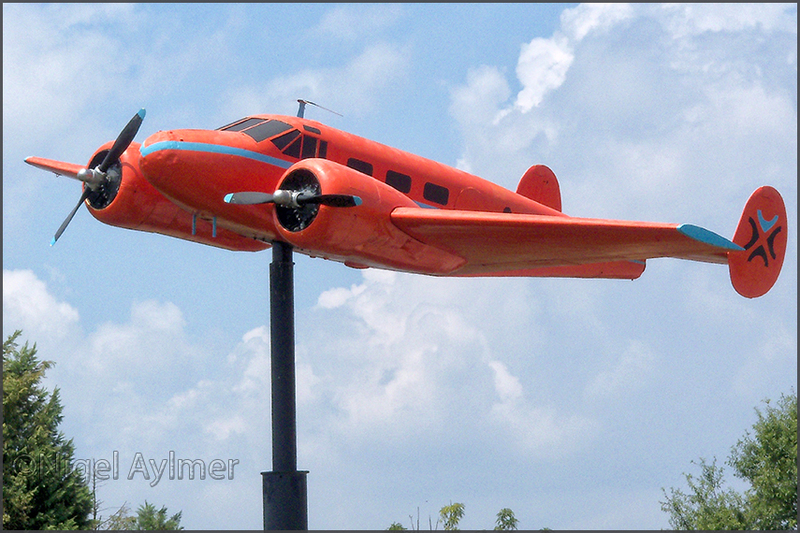 Am looking for the identity & details (tailnumber, previous owners & operators) of this Beech 18 roadside on the I-25 in Georgia, south of Augusta. While it is on Google's sat imagery (above, April 2019), it is not yet on streetview; so it must be a recent change..? I posted this on Facebook's Beech 18/ C45/ AT11/ SNB Group and this led to various helpful suggestions! Larry Wixom wrote: "I live in GA. It was along HWY 20 on the north side of it. The plane has been removed. Taken down about 18 months ago. Not sure where it went." 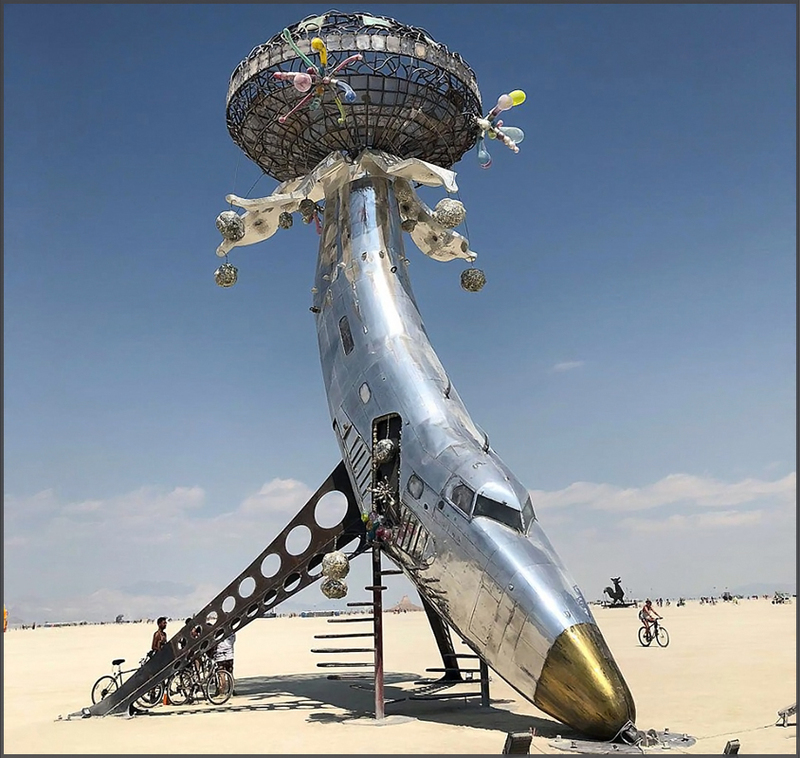 Terry Fletcher: "I think this will be the aircraft at Martinez, GA . From what I can find the site was known as Funsville back in the 1990s, changed its name to Adventure Crossing in 2008 before closing in 2016. On Aerial Visuals we have a 02May16 photograph - but the identity of the airframe remains unknown, although Geoff Goodall has N7131 as unconfirmed registration on his website." 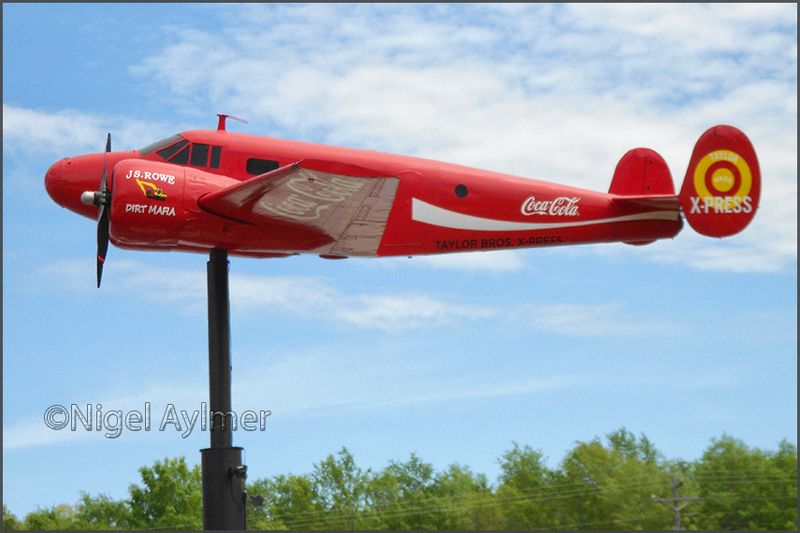 And here on the I-25, south of Augusta, at Taylor Bros. X-press; nicely decorated now, even if it is advertisement! Nigel wrote: "Sorry I can't help with a positive id for this aircraft. 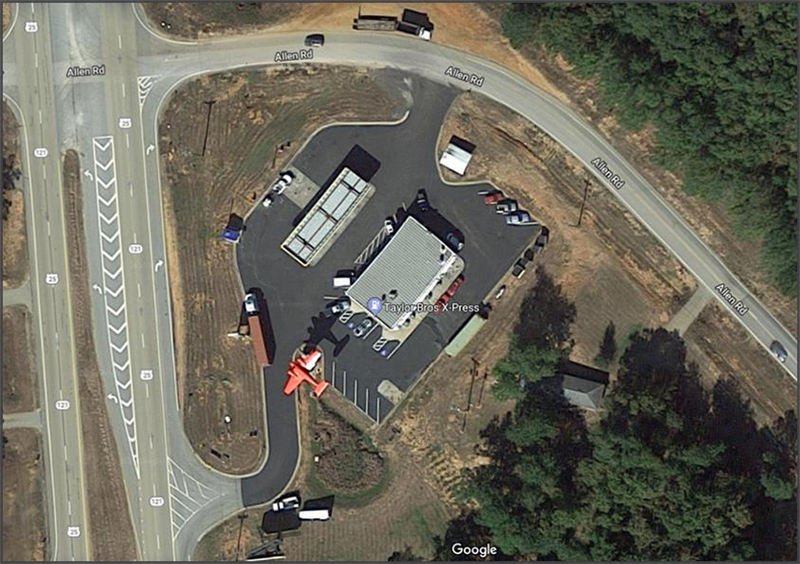 I believe it to be the same airframe that used to be at an amusement park west of Augusta, along the side of the I-20, possibly Funville? The Coca Cola scheme is current, the other at its previous location, I believe it was yellow in the 2000s." 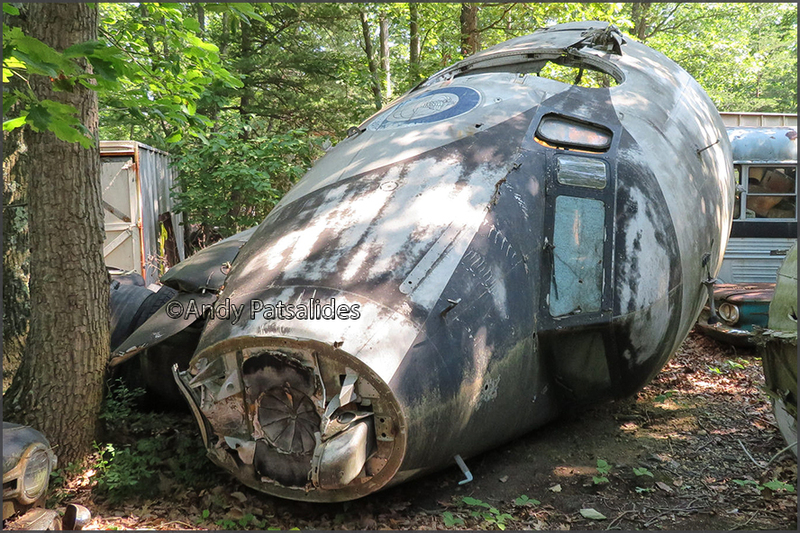 This website also has it reported, albeit not in its current position, www.oldprops.ukhome.net/Beech US Census : 'N7131' UC-45J On display at Funsville theme park, Martinez, Georgia. Real identitiy unknown. So I started to dig a bit around the history of the amusement park. 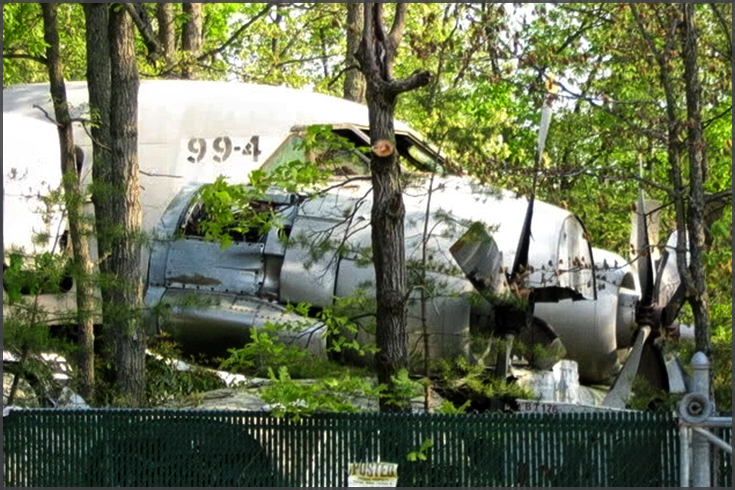 This is a screendump dated Nov.2015, it still shows the red Beech C-45 at Funsville a.k.a. Adventure Crossings. 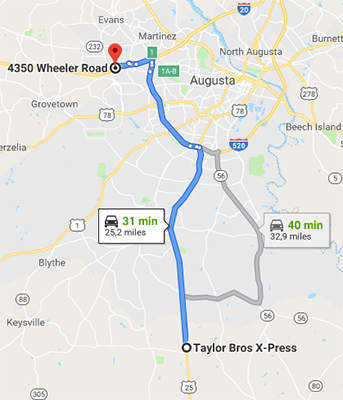 The park's adress was 4350 Wheeler Rd, Augusta, GA 30907 but most often referred to as @Martinez,GA. 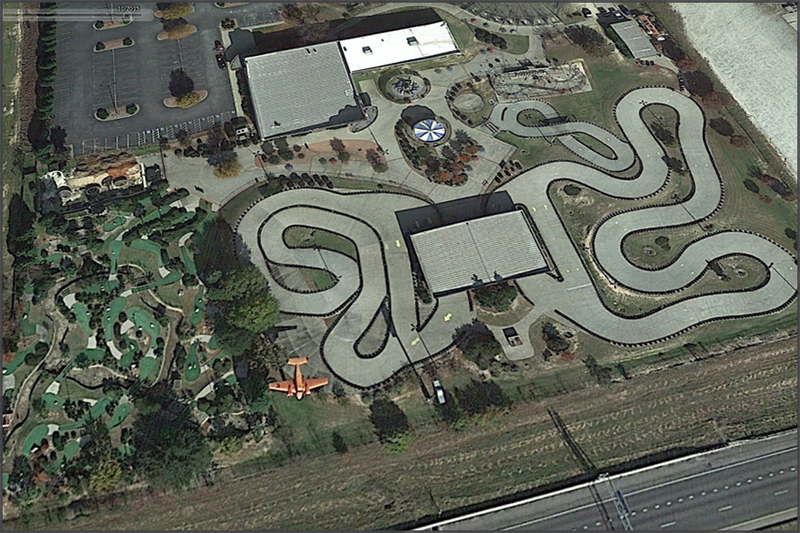 (www.wrdw.com) Adventure-Crossing-fun-park-permanently-closed- By Alma McCarty [Nov 09, 2016] MARTINEZ, Ga. (WRDW/WAGT) -- 'The fun park Adventure Crossing closes it's doors for good. The owner of the park tells News 12 NBC 26 the news of the closing came as a surprise to the 25 workers. Eight of them were full time employees. He says it came down to a business deal between an interested buyer and the landowners, with the location and offer too good to pass up. "It's going to be very missed and I think people will really realize what a gem it is now that it's no longer here," said Michael Brown. 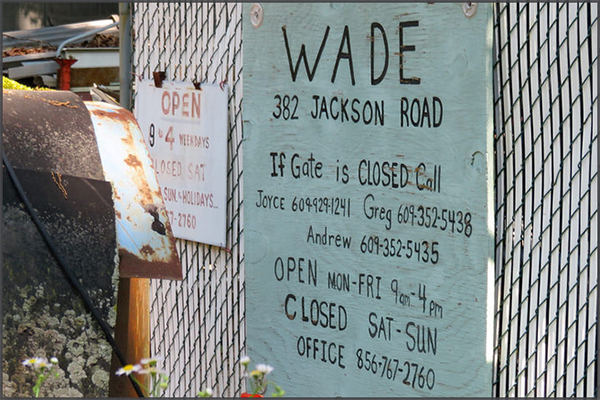 I found Wade Salvage (or Wade's) near Berlin,NJ - a little east of Philadelphia. 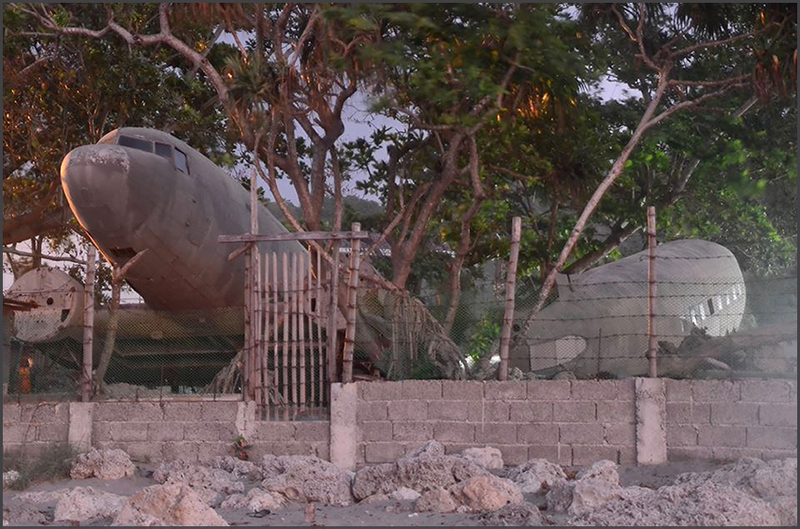 It looks like a DC-4/6/7 to me there in the back. That all black nose: an early FAA colour-scheme perhaps? 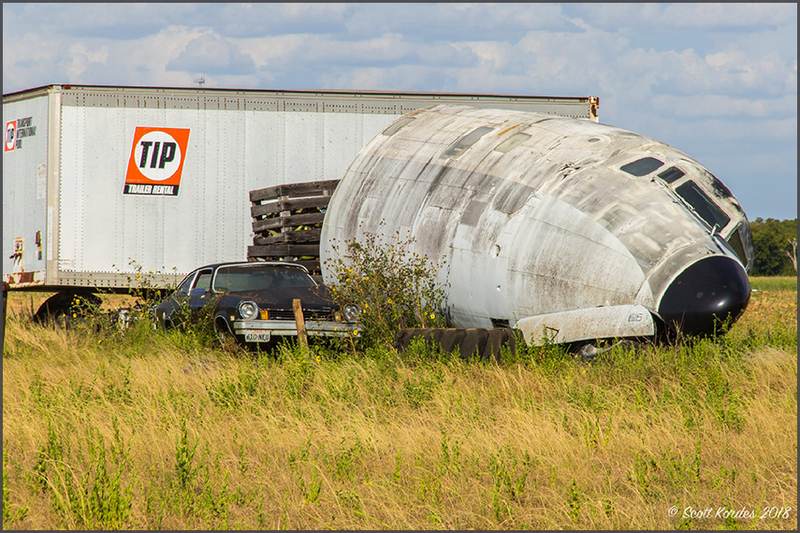 salvage yard for a photo opportunity. More 'propliners', as well as cars and busses and whatnot, was photographed. Andy Patsalides has this on his Flickr.com account. Taken on June 18, 2018. 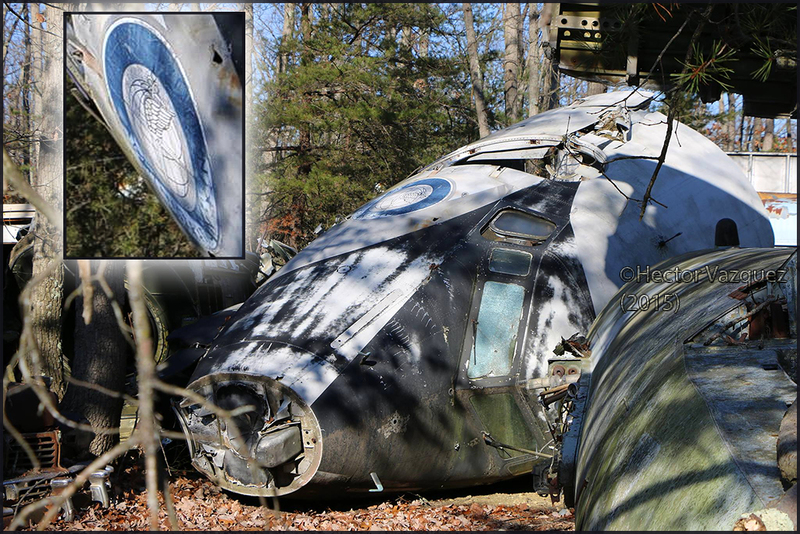 Bill Dolan wrote: "The badge on the side identifies it as an Federal Aviation administration aircraft. Hard to tell what model." Douglas wreck at Wade Salvage, Atco,NJ (2015). Christian Tendick wrote: "I did a little research out of curiosity, .. it’s a 6 or 7 because of the radar nose. 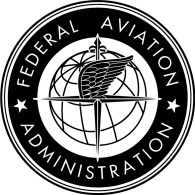 The FAA owned a few 6s and 7s, but only 6Bs and those went to secondary operators. 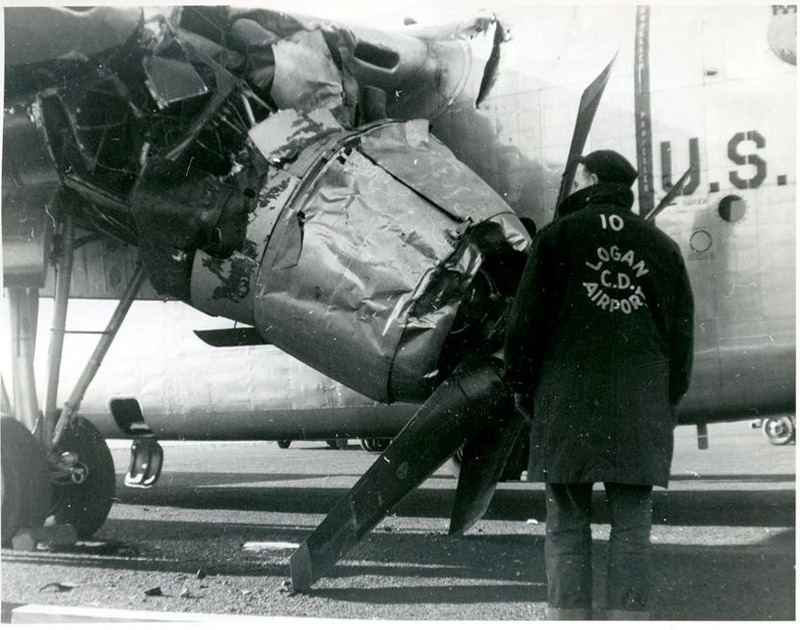 Because of the small crew door, I am guessing it’s the nose from DC-7 N464 that had a nose gear collapse at Washington Dulles while operating with the FAA in July of 64. 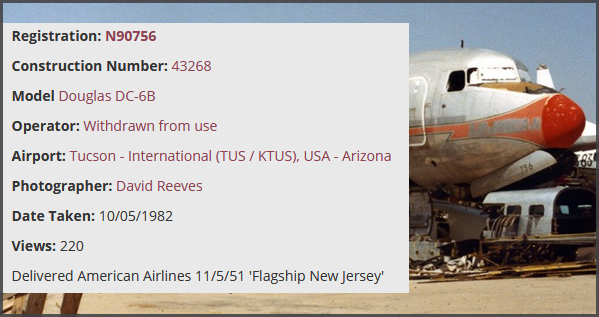 ATDB.aero has DC-7 N464 (c/n 44127) as '	Destroyed (controlled crash for cabin flammability rules)'. N381AA next to a C-118. 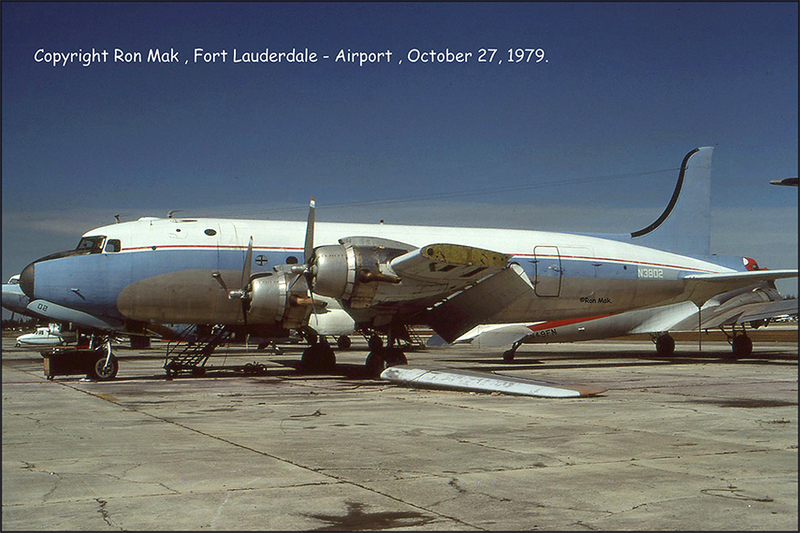 This is why I thought it may be DC-7 N464, which was also an ex-AA 'straight early' DC-7. Possibly only American Airlines ordered the small door on theirs, not sure if any others did." 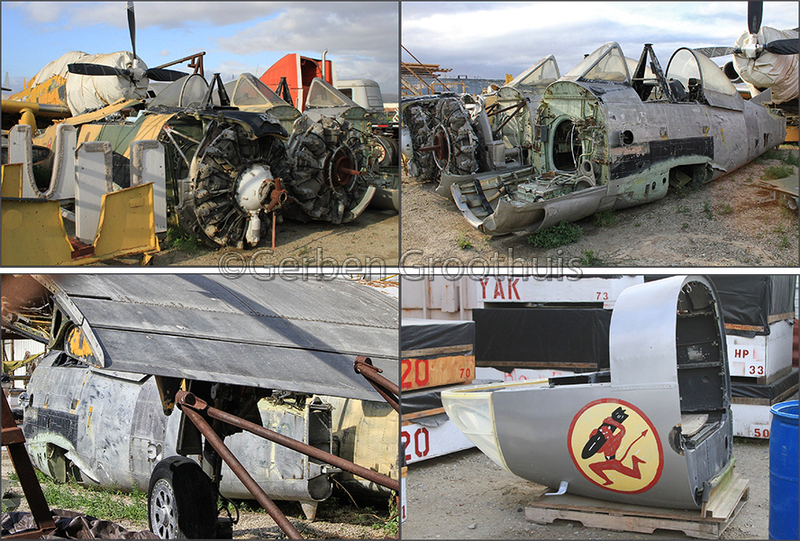 And more proplinere here at Wade Salvage..
the cheatline) the same DC-6 as below. 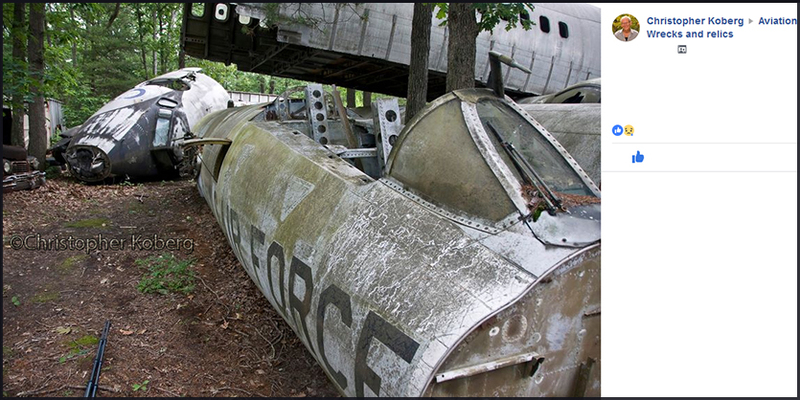 Such a surprise to me to find so many plane wrecks ('propliners') here @Wade Salvage (Atco,NJ)! John Adkins suggested: "Look behind the service door--there appears to be two windows, then a space. That would be a DC-6B, and N90739 (my photos in the Ted Quackenbush gallery) was a straight DC-6. N90739's cheatline was a solid red (newer repaint), not the AA int'l orange color; it didn't have the word 'American' painted over inside the cheatline either. 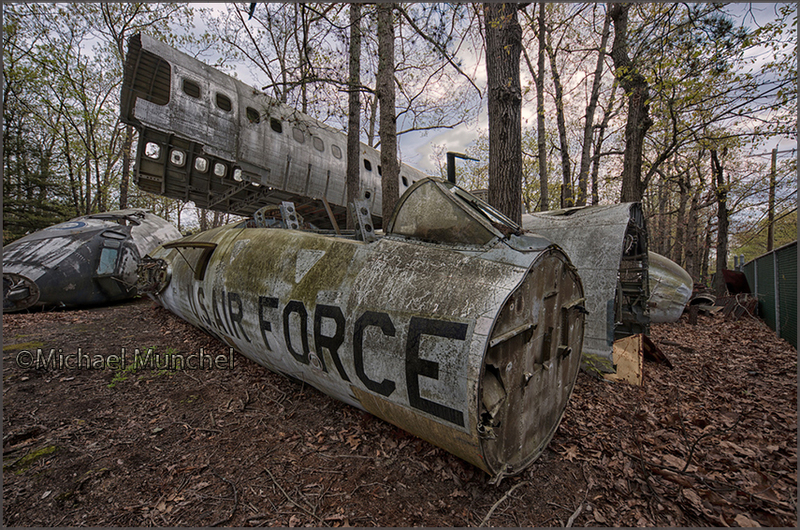 Looking for some derelict AA DC-6B candidates? 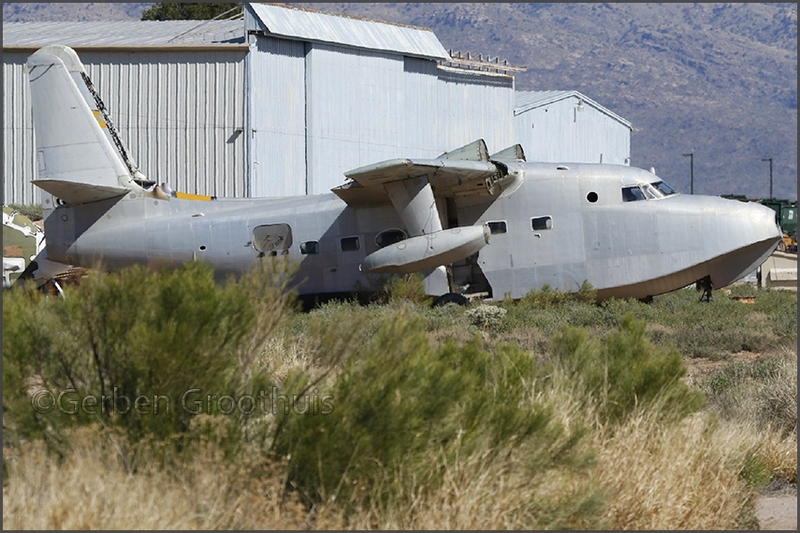 How about N90756, which sat on the Hamilton Aviation lot at TUS (Tucson,AZ -webmaster) for years. 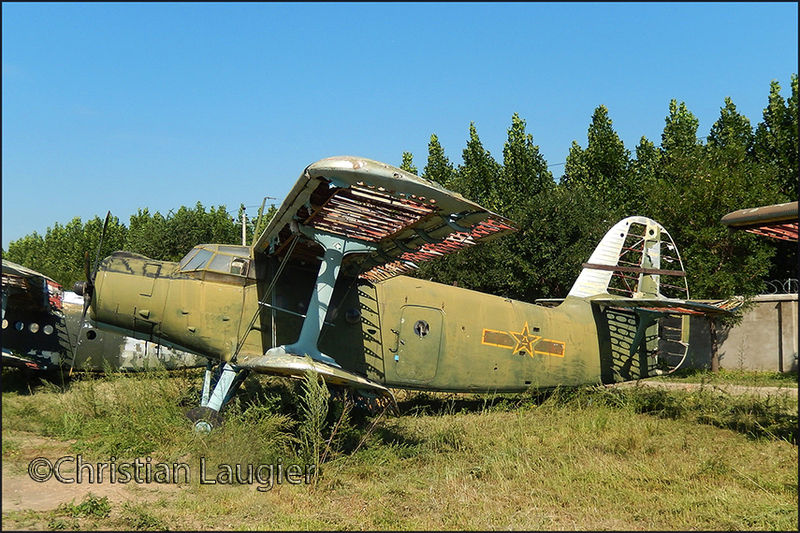 I don't know of its final disposition, but it did have the original (faded) int'l orange cheatline and the painted over titles just like the scrapped A/C photo above at Wade Salvage." While I did not see 'space between two windows' and 'American painted over', but comparing various images online, including the one below, I think the two blemishes in the cheatline on the nose are distinctive enough to identify this airframe as N90756! Douglas DC-6B N90756 served no other master other than American Airlines, although FAA's data shows it was deregistered on 17May2013 from previous reg'd owner James D. Melvin. Perhaps he was the owner during the long period of storage at Tucson? Another plane wreck, marked '994'. Distinctive difference in the cockpit windows, a British design? 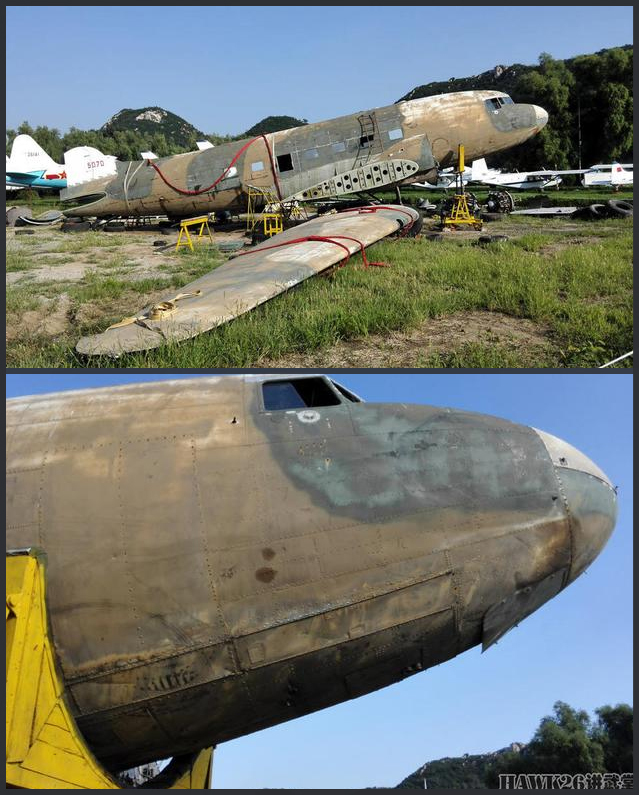 Andy Patsalides visited this salvage yard 18Jun18 and also noted the cockpit of 53-0210, a Boeing KC-97G, and several jets. with the airframe as I believe it is a Convair 880, possibly N804AJ, which was destroyed by the FAA at Atlantic City, NJ. 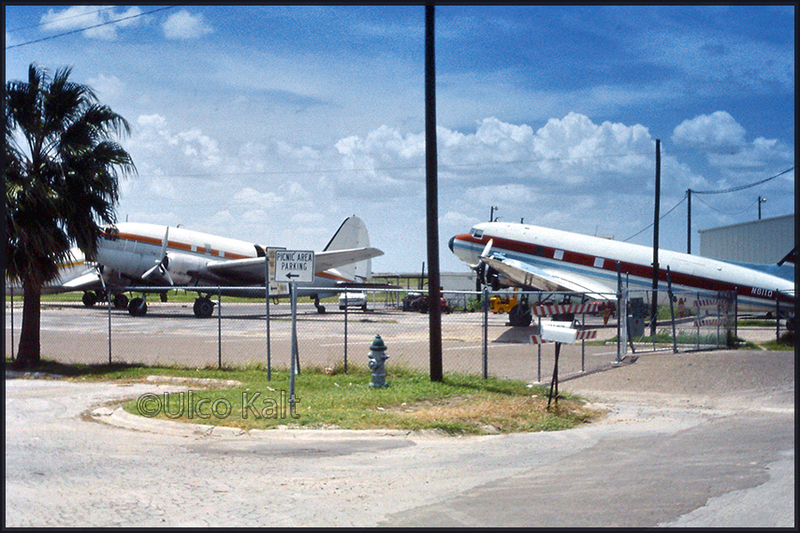 See the Munchel collection of pictures again: Convair 880 N807AJ is also in the Wade yard, full nose section laying on left side . Also at least one Grumman C-1 Trader. Convair 880 N801AJ is with the Teterboro NJ museum." 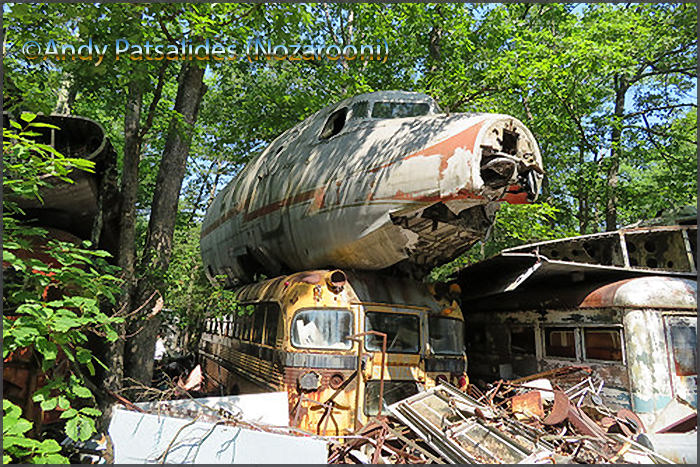 Remains of DC-7's N464 & N68N may be candidates. The DC-6's seem all accounted for (operators after FAA use). as c/n 10452 seems be quoted for it. several Lockheed airframes seen from aerial photos, but little or nothing on their previous identities. identification (could be recent additions). 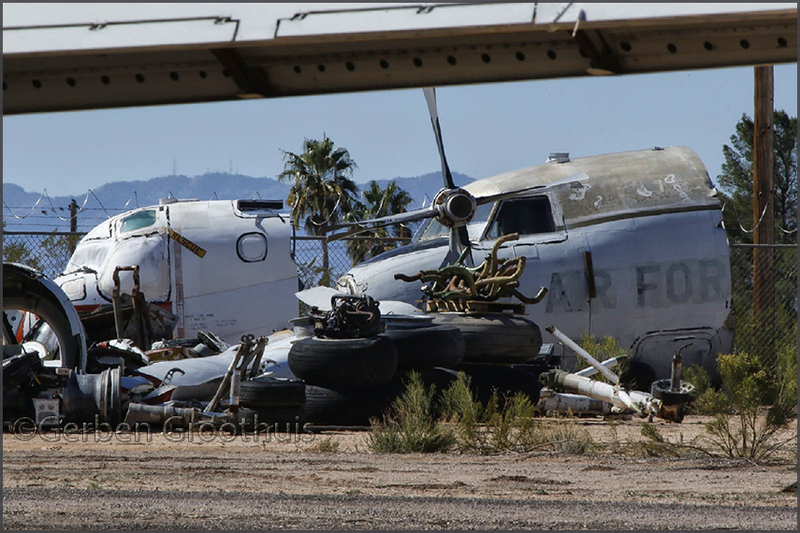 Photos shared by Scott Kordes on Facebook's 'General Aviation Junkyard'. That red cheatline must bring candidates for a former operator, surely..?! READ ON! 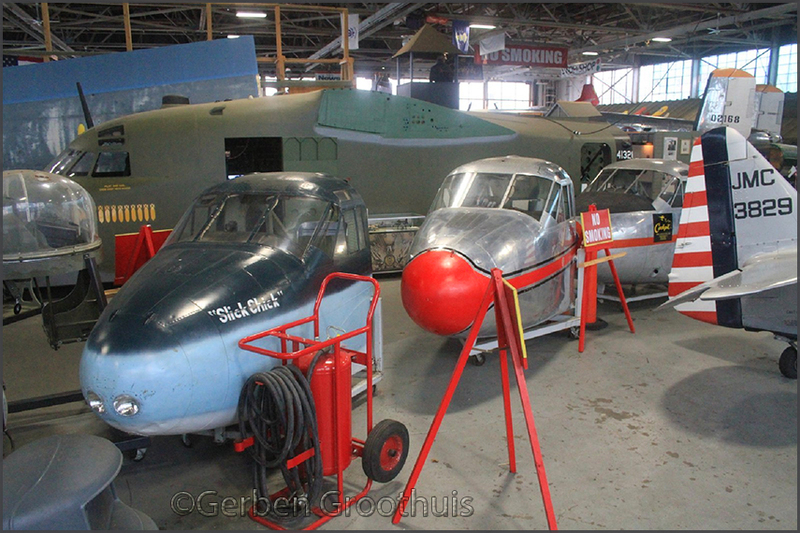 Other identified airframes stored at Marion-Zuehl are: DC-6 N578AS, Beech 18s N9549Z & N9NK. I knew that the owner of these airframes here at Marion-Zuehl Airfield had someting to do with Nighthawk Air Systems, formerly based on Willow Rin (YIP Airport). This was the basis for my research into these 2 airframes. Comparing the red cheatline and white nose radome I found N111AP a candidate; this I found confirmed on ATDB. Trans Air Link (leased & returned), to Express net AL (N111AP), to Nighthawk Air Systems - 'Unused. 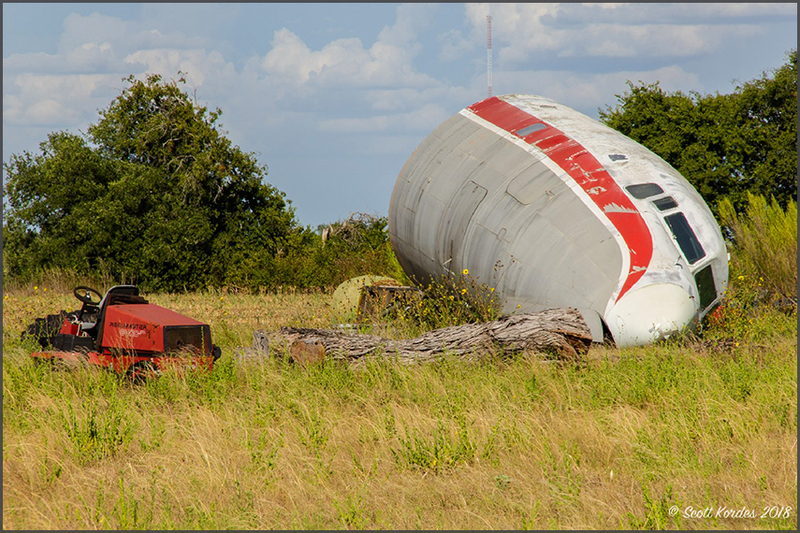 Scrapped at YIP (nose section to San Antonio-Marion Zuehl, TX). In my own files I found it was already reported here at Zuehl in august 2009! (nose section to San Antonio-Marion Zuehl,TX)'. Belair Airlines (HB-IBV, but unused), Span East AL (N616SE), Express net AL and Nighthawks AS (same). I think a local resident, James P. MacIvor, owns these airframes; he worked for or owned Nighthawk AS. His name was mentioned in newspapers when local residents opposed the move of these propliners to Zuehl airfield. 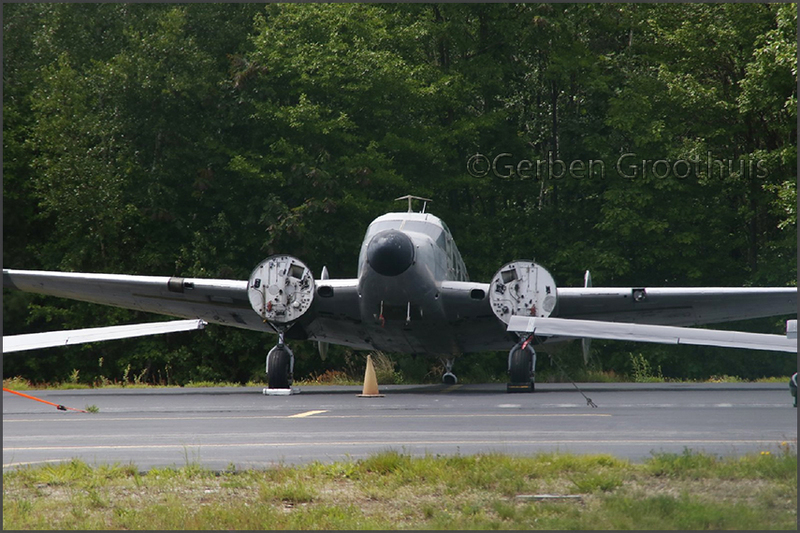 "The Nashua, NH head-on view is of 1956 E18S N125X BA-192. Spent some time as C-FXKG for Gold Belt Air Transport, Pickle Lake 1996-2001 & suffered three (!) accidents (02Apr96 Webequie, ONT. lost control in crosswind landing, hit a snowbank; tail wheel & tail damaged. No injuries. 26Nov96 Muscrat Dam Arpt (MSA), ONT. in gear up landing. And 01Sep01 at International Falls, MN landed gear up. 1 uninjured.). N125X for Denis G. Lison & Michael J. Farrey, Mason, NH; reg’d 07Sep01. Current." Photos taken in May 2017. 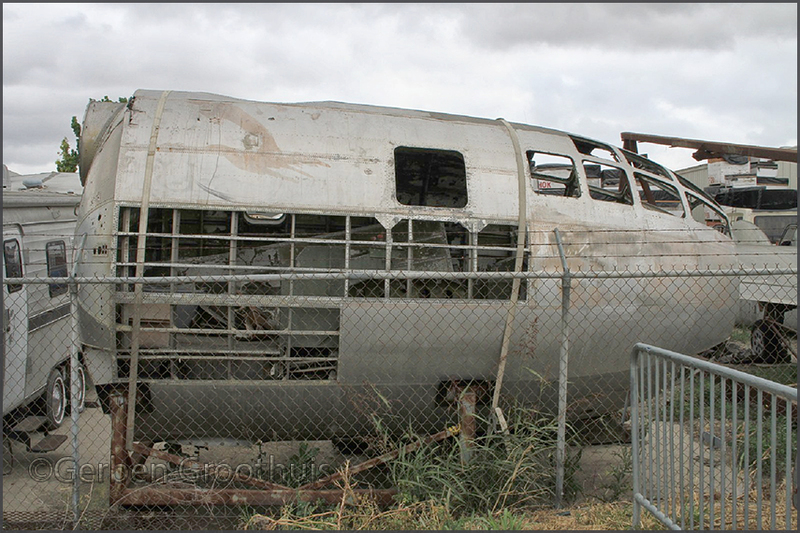 Gerben wrote: 'Not many B-29/B-50’s left, so one would expect these would have been identified. But no so. Someone offered: ".. Probably either 44-70049 or 44-84084". Based on johnweeks.com/b29/index. while the name "Slick Chick" is also a tribute, to WW2 B-17 bomber (albeit here without the nose art). Probably been from a collector for whom fun was more important than authenticity. Perhaps all from same collector? Jeff Clyman? 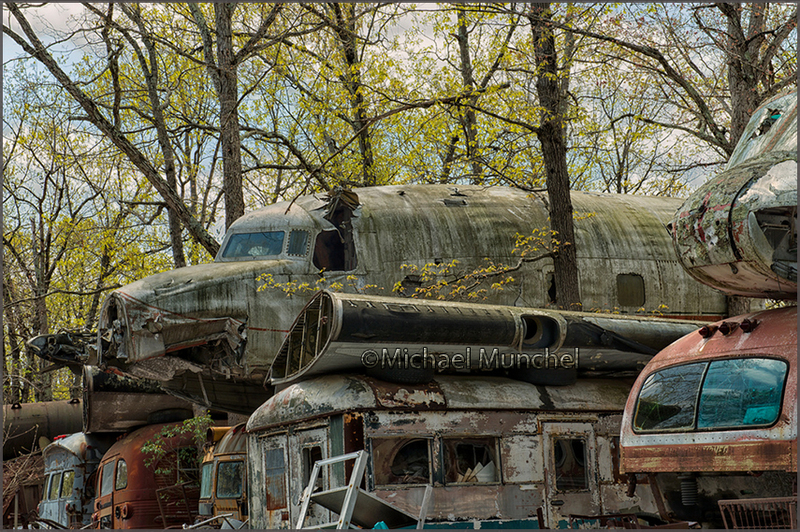 On the left, also at Farmingdale's AAM, an unidentified C-47 - named 'Sack Time'. 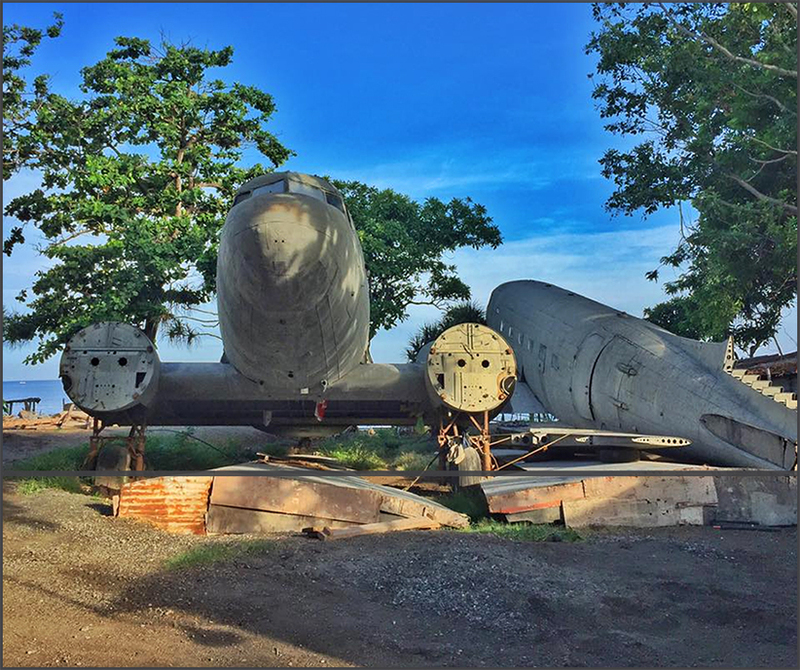 In the background at the Farmingdale museum is this strange contraption which seems to resemble a bomber/cargoplane? Terry Fletcher provided the information: " 'Teacher's Pet' is a travelling exhibit! Grant Newman visited the 'Civil Aviation Museum of China', in Beijing, on 20Sep2017. Little hope to identify this one as numerous attempts have been made, afaik. 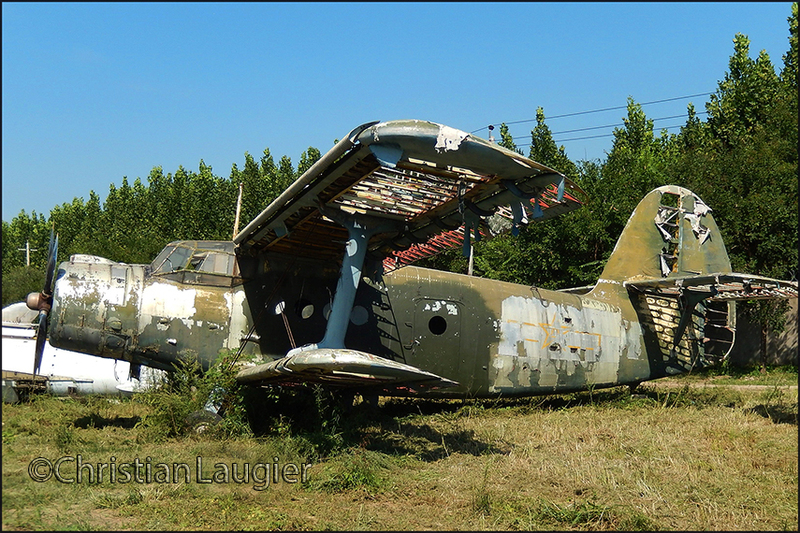 Lisinov Li-2, 38068 or 38043?????? Jürgen Scherbarth put an identification to this one (05Apr18): "The Y-5 at the Civil Aviation Museum in Beijing carried serial (B-)8807 back in 2011… (also cited as 8207, see below)". 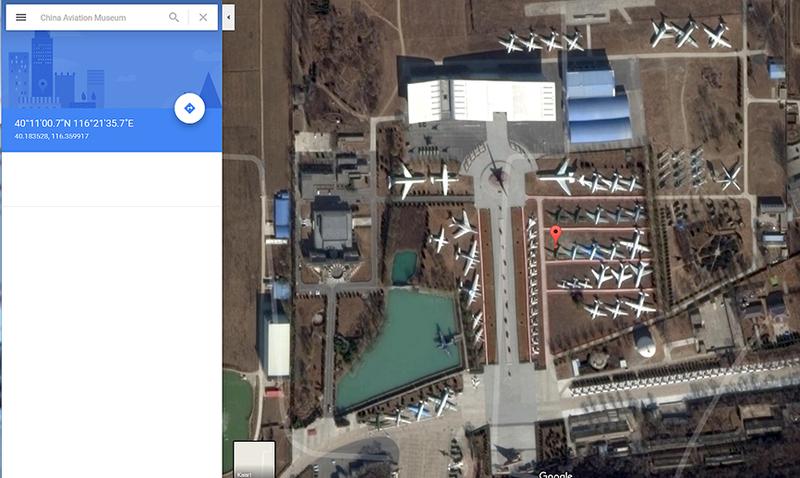 I never visited this museum, only the named Datangshan Air Museum (a.k.a. Beijing's Xiatangshan Air Museum) in 2002. 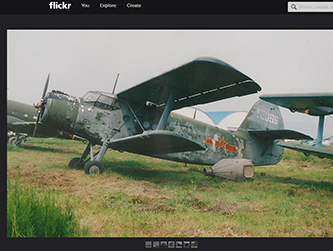 Grant's photos were taken at the China Civil Aviation Museum, which is at Chaoyang (Beijing city) and not @Xiaotangshan. Two different museums! 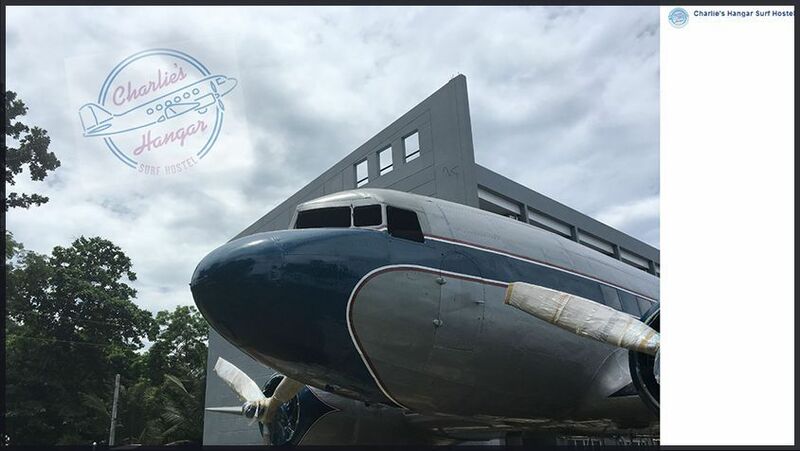 Charlie's Hangar Surf Hostel DC-3(s)... These images were sent to me by Juergen Scherbarth last month. The latter is the flagship, parked right in front of the hostel but does not have any markings on the exterior. 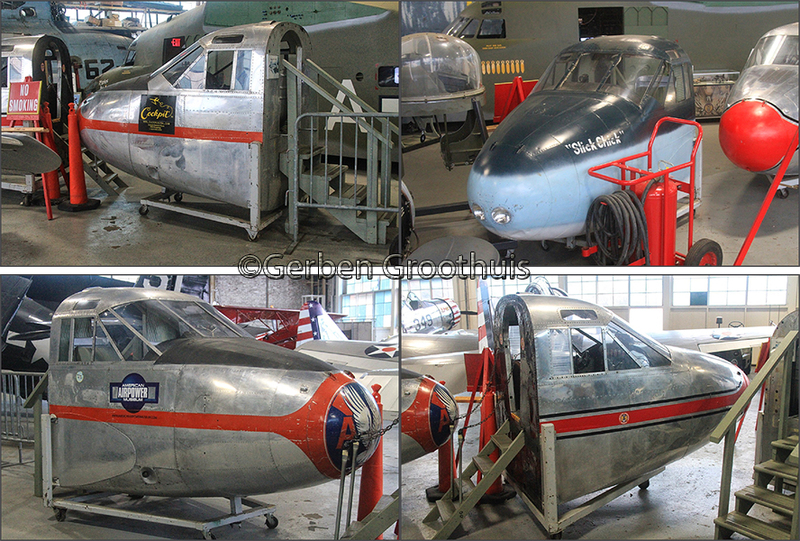 The owner is the son of the former owner of these Douglas piston transports, C.M. Aero Services (Charlie Miller). Note- RP-C1354 is sometimes identified as c/n (msn) 25571 but this is not correct (according to the Scramble report). One for my Off-Airport Gallery (Latin America) but at time of posting also a candidate for 'Unidentified'.. The adress is Surfer's Road, Brgy. Urbiztondo - 2514 San Juan (La Union) in San Juan on the Philippines! 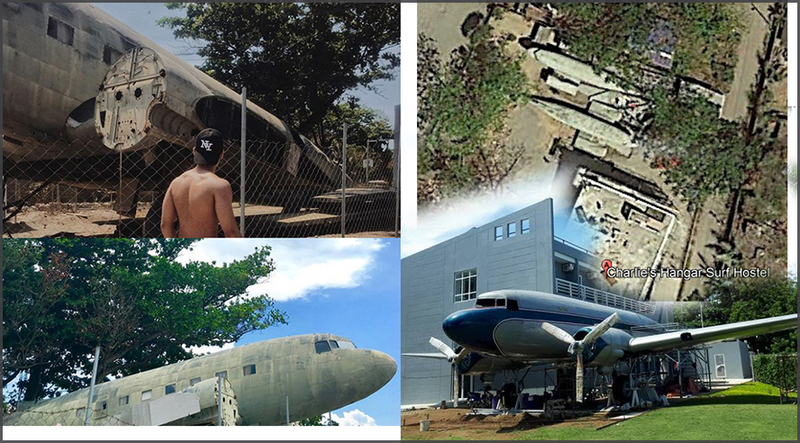 In Scramble's edition #461 (Oct.2017) I read the following: "On 01Aug2017 'Charlies Hangar Hostel' opened in San Juan, in Northern Philippines. 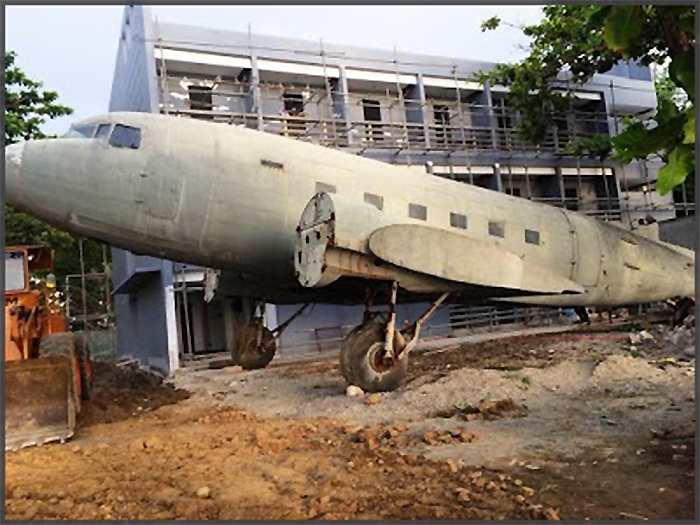 Centre piece of this backpacker/surfers hostel is a DC-3. 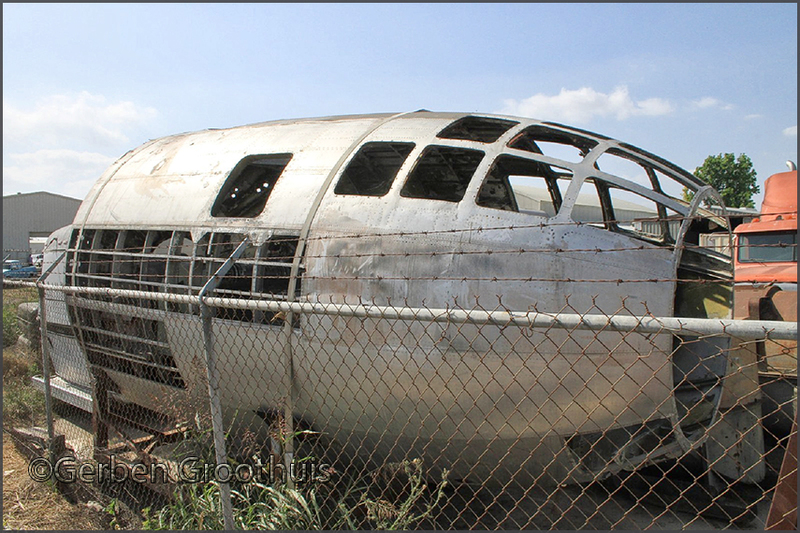 We have not yet been able to identify the DC-3. 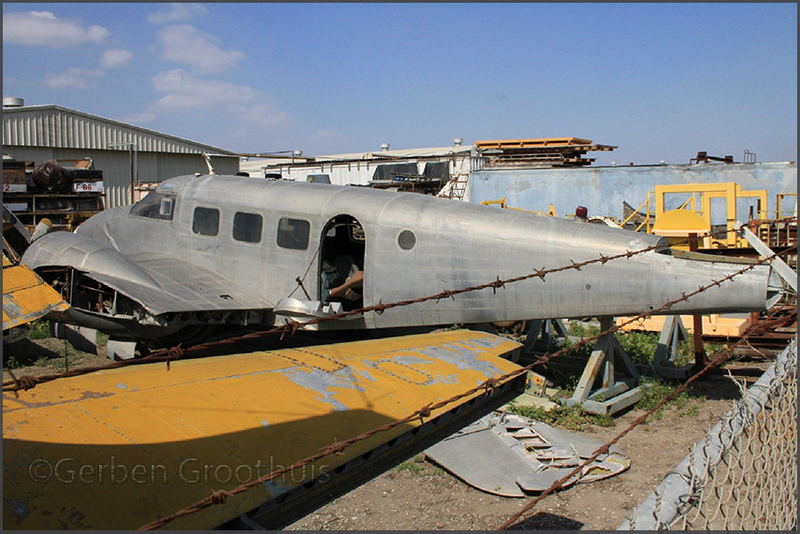 An earlier travel blog dated May 2017 shows work in progress with the DC-3 in bare metal up in scaffolding and with several repair patches on the nose. So the blue colourscheme it has now, is not original. 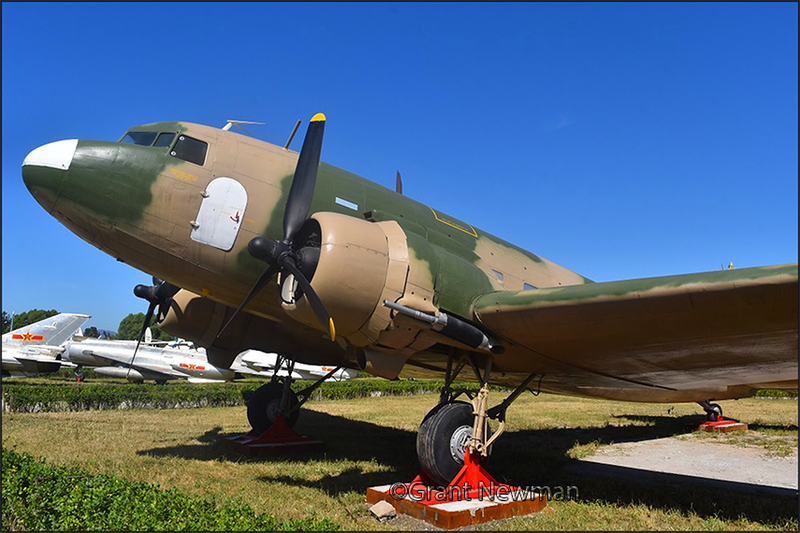 The DC-3 does not have the tail mounted beacon light, which the civil Philippine Daks used to have, making it unlikely that it is one of the DC-3s that were auctioned in late 2014 at Manilla IAP." The owner is the son of the former owner of these Douglas piston transports. In the dec.2016 issue of Scramble magazine I noticed an interesting news bit, and found the mystery here very appealing! Alexandre Avrane offered:"This appears to be in the original Zimbabwe camouflage. 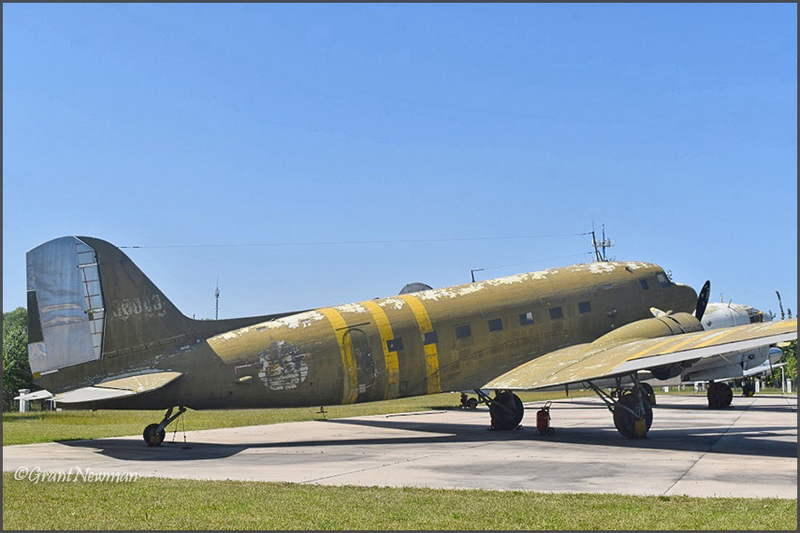 Each C-47 was painted differently so all is needed is a pictures gallery for comparison..."
Apparently this C-47 was bought from the Zimbabwe Air Force in an auction in 2011, crated & shipped to Pakistan (! 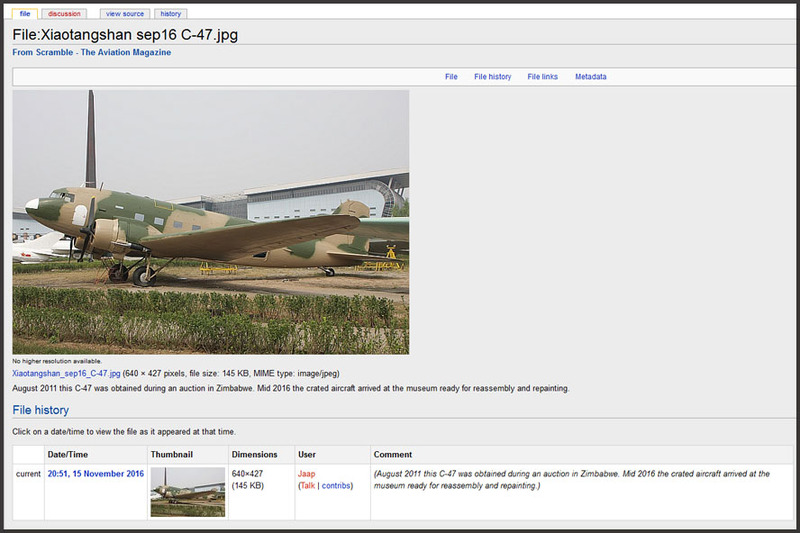 ), continued overland to Bejing / Xiaotangshan & reassembled and "repainting in full swing.."
Found on www.dc-3.co.za/dc-3-in-africa/zimbabwe.html remarked "Seven ex Air Force of Zimbabwe C-47 Dakotas were put up for auction in September 2011." The aircraft are all located at Manyame Air Base in Harare, Zimbabwe -17° 55' 45.20", +31° 5' 57.52" click on co-ordinates to open in Google Maps." 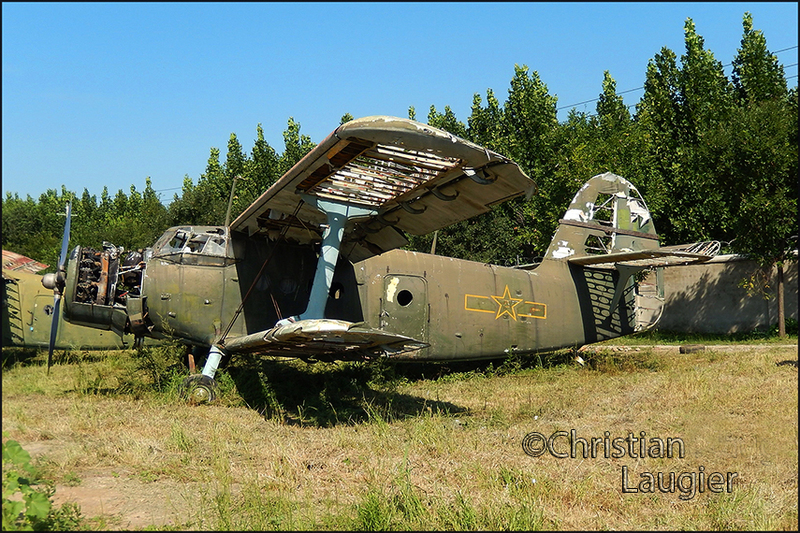 And "By July 2014 one of the aircraft had been dismantled and taken away. Details unknown." At first I thought ZK-AMR (cn11970; see my website) a candidate, but according to ATDB.aero it was scrapped at HRE. *) = To Preferred Air Parts, Kidron,OH (the above sighted at Wonderboom, with N572PT/7301 according to Tripreport in Scramble #474 2018)- see also note further down. On 20Oct2017 I received a jubilant email sent by John Austin-Williams. 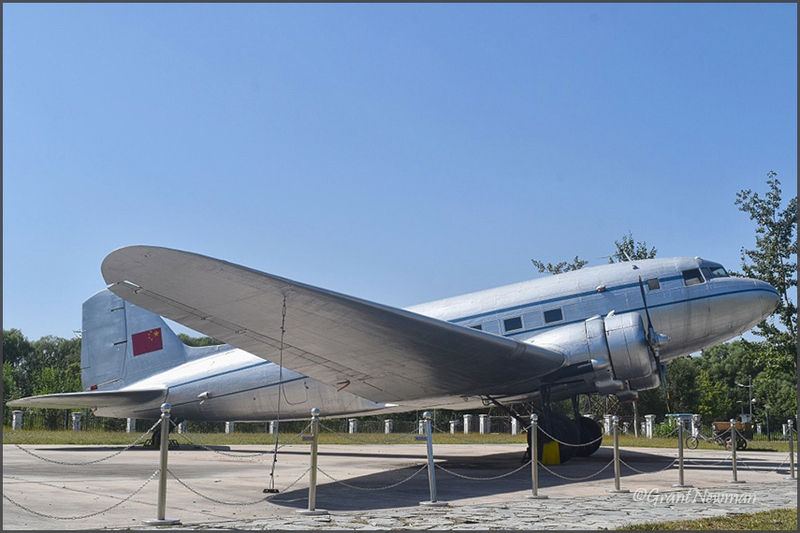 "I have solved the puzzle of the DC-3 / C-47 at the Xiaotangshan Museum, it is 7313! Looking at the photo you (this email originally adressed to one David McCartney -RL) sent of the one in the China Museum, Xiaotangshan, I noticed that the top of the nose cone is white. And also the cockpit 'Hamburger Door' is white. And I then suddenly recalled I had seen photos of the 7 aircraft and I’ve found them! 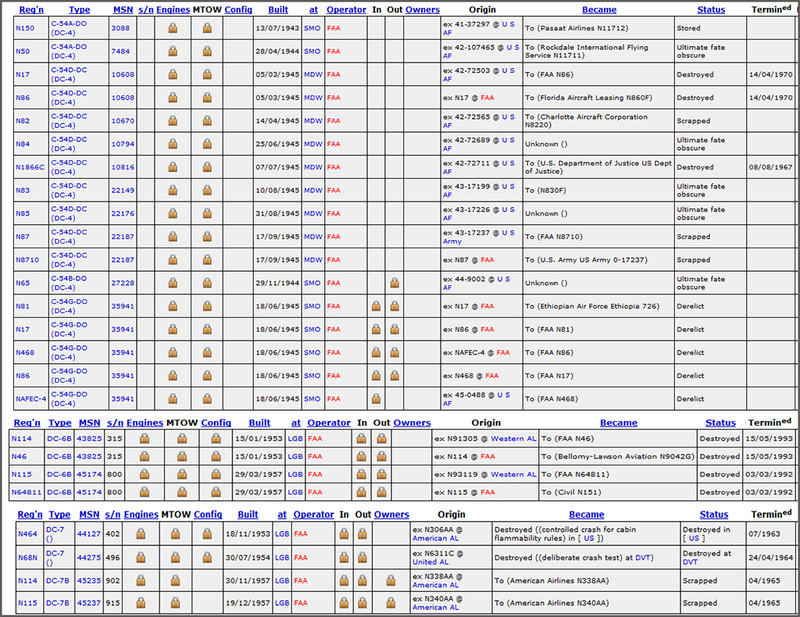 There was an auction website (www.aaauctionszw.com) where the seven were advertised; an individual web page per aircraft. At the time I had the foresight to save each page! This auction came to my attention on 01Oct2011, six years ago! I have compiled the 7 pages into one MS Word document attached. The last aircraft, 7313, has a white top to the nose cone, no aerial rails on the roof and a small white circle below the right side cockpit window. If you compare the camouflage scheme of 7313 to that of the Datangshan example, one sees that the camo scheme is very close! In actual fact if you look at the other six aircraft they all have no-descript colour scheme – almost all-over beige/brown colour, whereas 7313 has a distinctly obvious camouflage scheme – green and brown. To me the photographic evidence is highly convincing! Click the link below – I believe the aircraft is parked here: GPS 40°11'00.7"N 116°21'35.7"E (40.183533, 116.359912) - www.google.co.za/maps/place/...China+Aviation+Museum "
David McCartney also wrote me (Oct.2017): "We have now identified the C-47: it is ex Zimbabwe Air Force, serial 7313, c/n 15993/32741 ex G-AMPS." 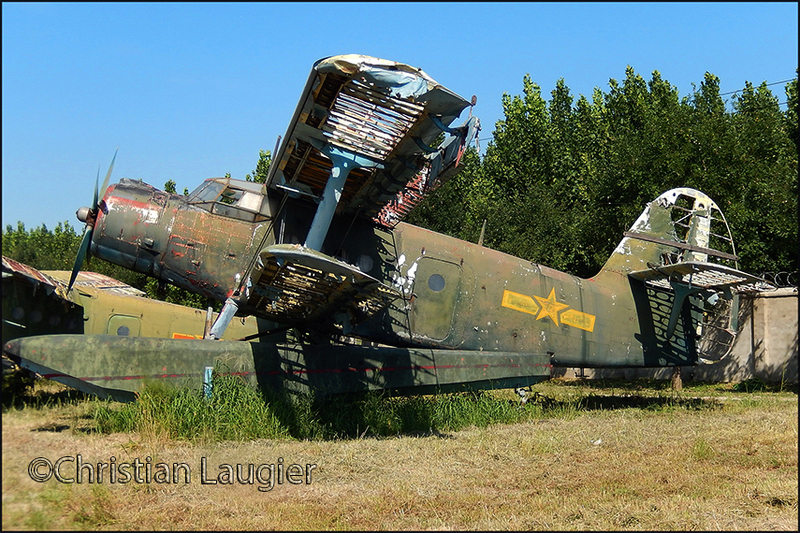 Although it was a long time ago, I visited the socalled Datangshan Air Museum, north of Bejing. 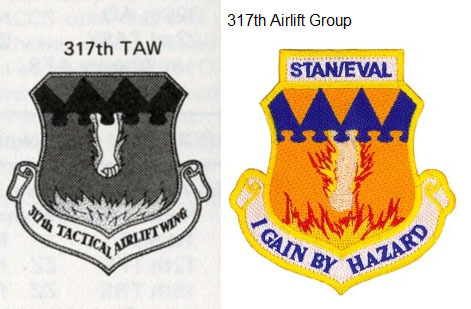 Note: former Zimbabwe Air Force C-47's 3700, 7036, 7053, 7301 and 7303 were procured by Preferred Air Parts of Kidron,OH and sighted at Johannesburg-Wonderboom (no date, but read in Dec.2017 issue of Scramble magazine). That leaves one Zimbabwe Dakota unaccounted for. found their demise at Tenerife - but I could not find one of theirs ending at Las Palmas..?" Perhaps it was used as a firetrainer...? Photos could be found here: https://abpic.co.uk/pictures/registration/G-AJHZ"
The photo further down shows Juergen was correct. --> so if we ignore here "wfu Luton May'66" and "Derelict Lisbon 1968" we have a candidate! And found correct! The statements 'wfu' and 'derelict' were a little bit unduly. A DC-3 has as much lives as a pussycat, at least! 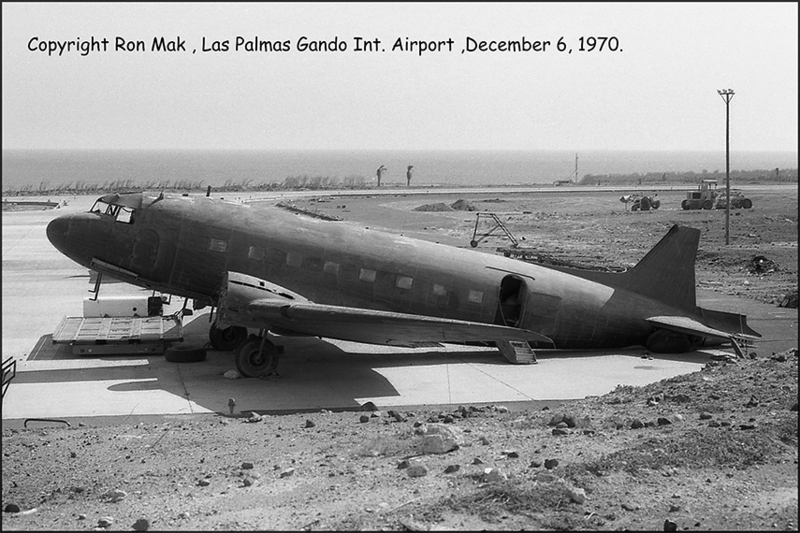 G-AJHZ is in the same position here at Las Palmas as in Ron Mak's photo. Unsolved -> Solved! Brownsville but I am not 100 percent sure... We drove from San Antonio towards the border of van Mexico (El Paso). So it could very well be Brownsville. The quality of the images are poor, tailnumbers are hard or impossible to read. I could make out: N320...? And N6110." 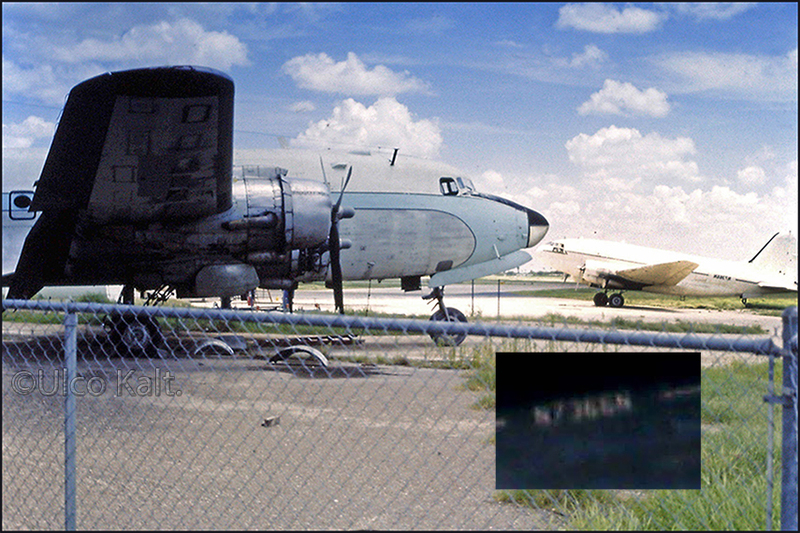 Mike Smyth wrote an interesting comment on the above: "I’m sure that the DC-4 is N32DR ex/ CF-KAD, c/n 18356.
at Alexandria, Louisiana in May 1981 by Stuart Jessop (LINK) and it certainly looks like the same aircraft." Further down there are a few more pics of this DC-4. DC-3's nor C-46's. So we probably have to look at an owner (not officially reg'd) beyond Florida Caribbean AL. year, 1985, as C-46 N7366N of Air Tram Leassing (see Alfonso's message below) near San Luis Potosí, México." 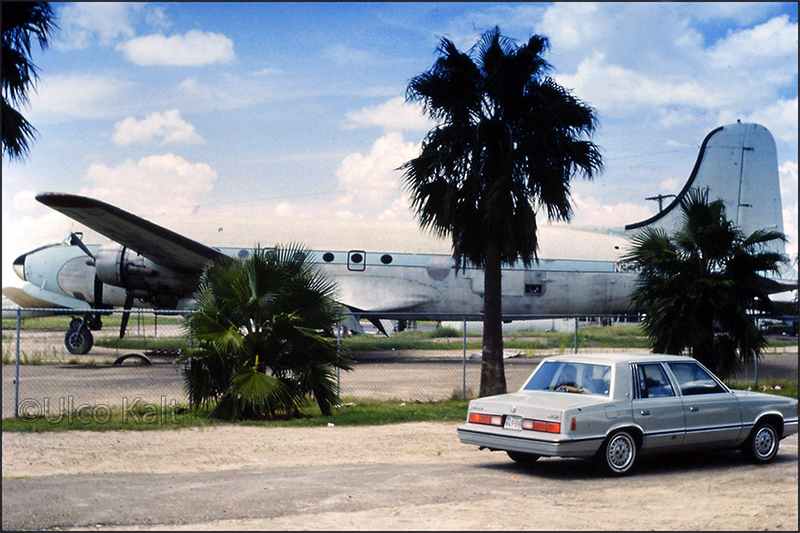 also as N6110, w/ FAA reg'd 22Jan1982 for Air-tram Leasing Inc, dereg'd 19Aug1985: exported to Panama). So this registration to Martin W Thomas (reg'd 26Jul78) as N2020, may never actually took place- fate unknown. Note the 1983 context in N6110's history and above photo. 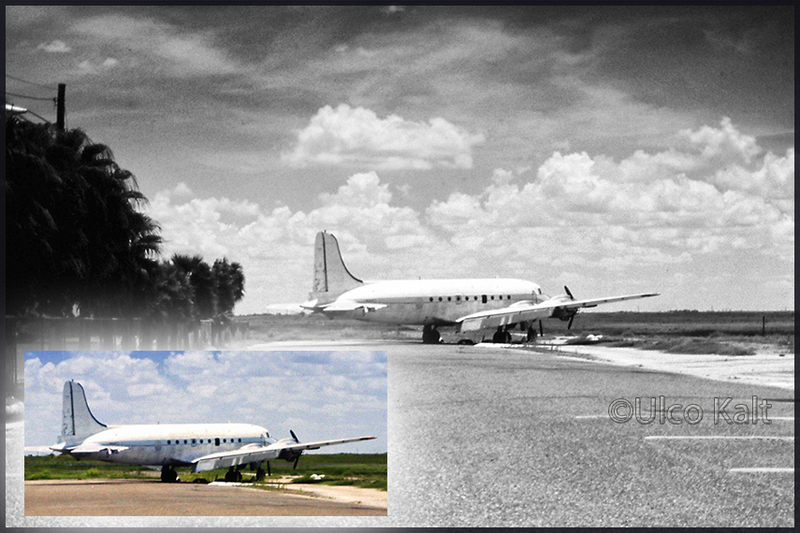 This is a mirror image but I have corrected the C-46 on the insert: N7366N most likely. 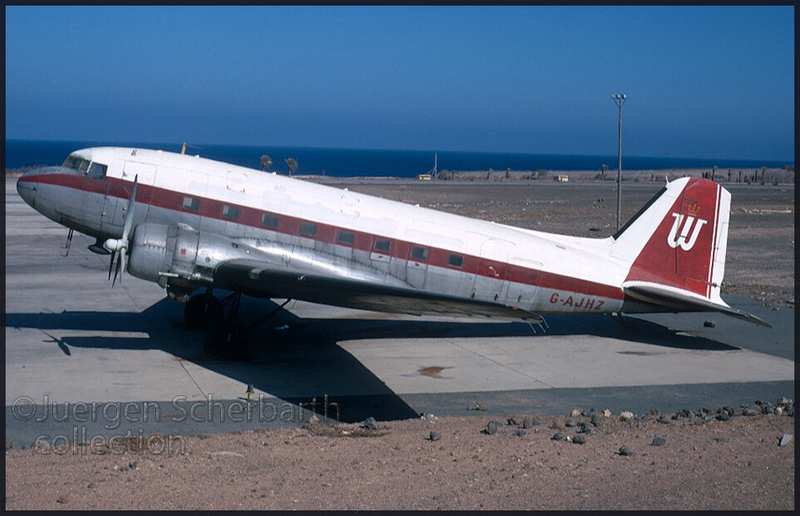 The DC-4 is believed to be N32DR (see further above and further down). Century AL NN7366L, Fuerza Aérea Mexicana TEC-6050 (Parted-out, derelict at MMSM-Santa Lucia AB). Alfonso Flores replied on the C-46s: "The C-46 N7366N (Air Tram Leasing) was ceased in the state of Veracruz, México, in May 1985 during an smuggling flight! 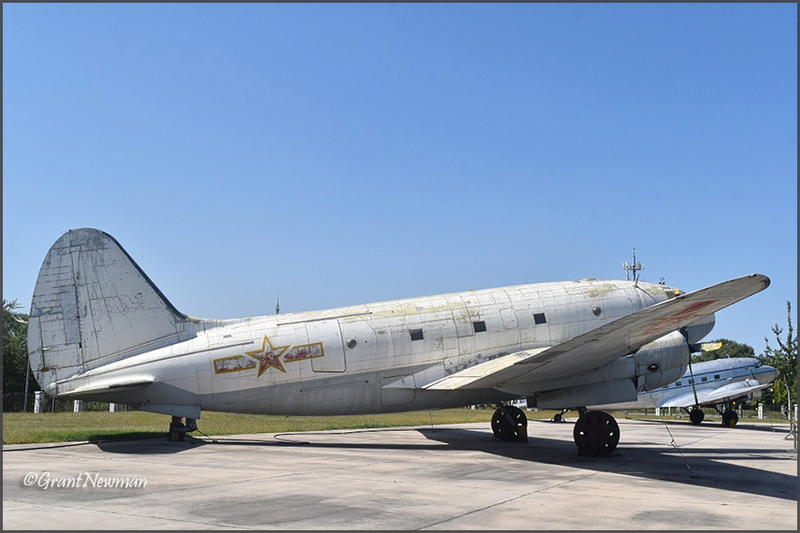 It was ferried to Mexico City airport by C-46 pilots of the Mexican Air Force and registered as TEC-6050; it flew about 4 years and finally it was scrapped at Santa Lucía Air Force Base in 1993." N320.. (?) can be read. Or N380.? I think N32DR is the correct answer (see further above Mike's comment). So we have here a DC-3 (N6110), a DC-4 (N32DR) and a C-46 (N7366?) plus one unidentified type. Taking Mike's comments at heart I think the location here is not Brownsville but McAllen, also in Texas. on 27Oct1979, when I took this slide. Seems to fit: a lot of blue (ex/ Nordair?) and the tail looks similar." 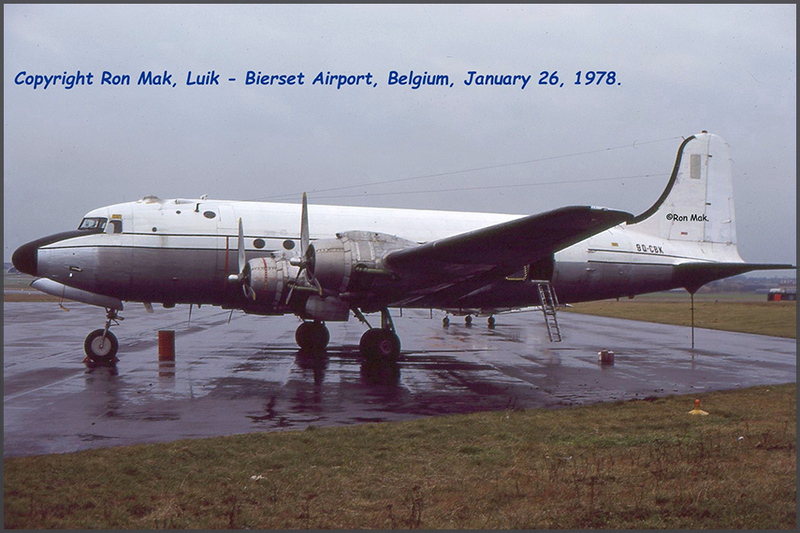 Alexandre Avrane:"I would suggest the DC-4 is N32DR rather than N3802 which wore slight differences in paint. And... N32DR ended at McAllen,TX so another clue which fits!" Stef Bailis wrote: "I do not think this is the same aircraft. Here are some differences: N3802 does not actually have a radome; it merely is metal with black paint. N320... has a radome (the contours are different). The cargo doors are very different: N3802 has small door forward, large door aft. N320... has large door forward, small door aft! On my monitor screen, N3802 is 15/32" from the fin, but N320... is only 12/32" from the fin." 18 10 29 N 66 19 54 W). "I found your contact when looking for information on the internet about Beijing Museum, which I visited in August 2016. I managed to get through most planes and I am wondering if you know further details about these 5 Antonov An-2's, which do not carry a registration. I am trying to identify them and it does not seem to be easy! I hope you will be able to answer my request. And an An-2 floatplane: 21397/10953. The latter is could be the one above, but Phil's suggestion below contradicts this. However I had no 10997 listed..? Phil Hawks' suggestions (on Yahoo's Classic-Propliners-forum) here are of great help, a final step would be 'which is which'. "The Y-5 on floats is 10997 (fitted with the rudder from 21353). It's not a genuine floatplane, BTW - the floats are from something different and have just been added by the museum." 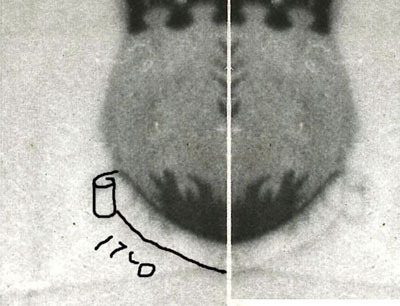 (It certainly shows likeness to John Bennett's 2011 photo (type described as AVIC Y-5). And to Trevor Bartlett's 2016 photo, but '10997, identity not certain'. "7225 has always been displayed in the tunnel, so if this is still the case, the others must be 3129, 3139, 10996 and 60066. 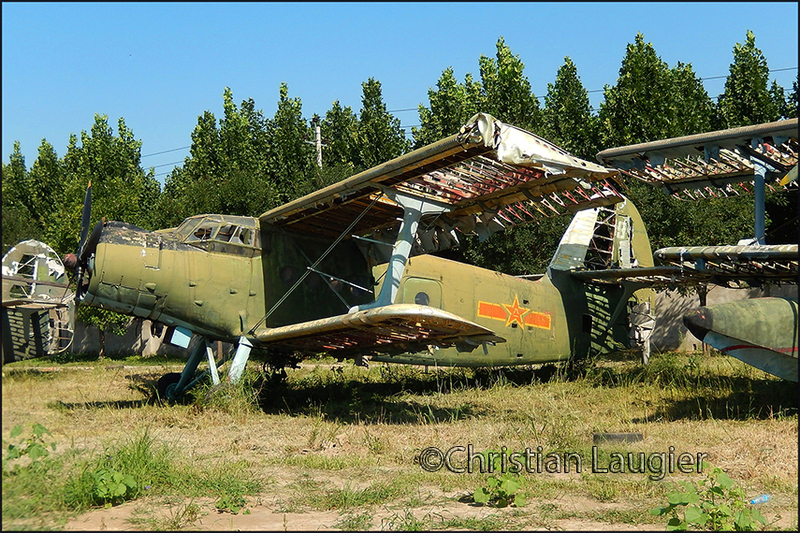 As to which is which, however..."
Unidentified An-2, Beijing's China Aviation Museum (2016, Christian Flaug). This one has a '9' on the remaining tailsection, so is 3129 or 3139. Check John Bennett's https://abpic.co.uk/pictures/view/1337494: which would make it 3129. Is this the one described as 'very tatty' (10996) above..? This one resembles 10996 on John Bennett's ABpic.co.uk/pictures/view/1337492 for its 'bleached'spots. But the timespan (2001 vs 2016) makes the differences in their wasted states rather difficult. 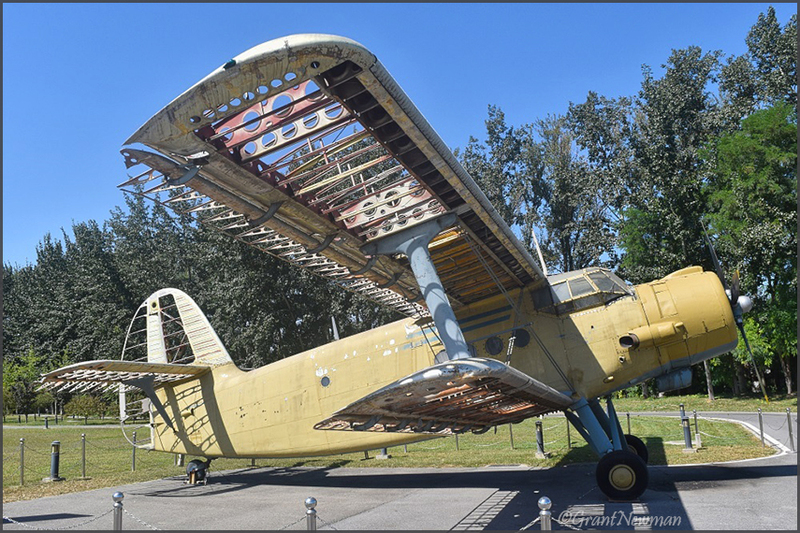 While on the subject of the AN-2, it celebrated its 75th anniversary in 2017!